Above: Interspecies Postal Service at Franconia Sculpture Park. Photo by Alicia Eler. 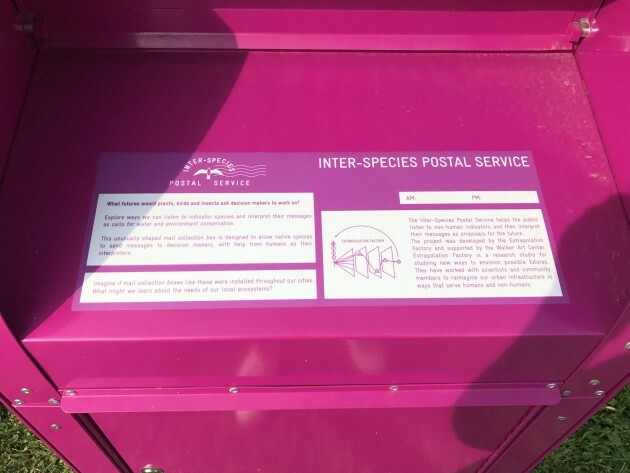 Pink mailboxes are the new blue U.S. Postal Service mailboxes. At Franconia Sculpture Garden, the Minneapolis Sculpture Garden, the Mississippi Watershed Management Organization, and the UMN Ecology Department Building, an artist project called "Transition Habitats" by Elliot Montgomery and Chris Woebken offers another portal into the affects of climate change. The project monitors the effects of climate change on monarch butterflies, migratory birds and lichen. It also facilitates the mailing of physical postcards to policymakers. So the project is participatory, accessible and informative. Through tracking migrating birds, the artists detect seasonal changes. Pollinators indicate environmental stressors. And lichen offer clues about air quality. 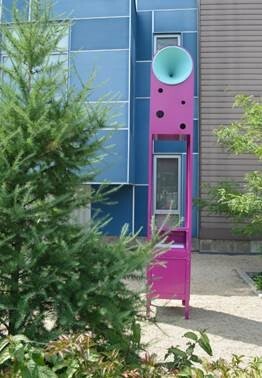 The Brooklyn-based artists work under the umbrella of the Extrapolation Factory, a design-based research studio for participatory future studies, and they came to Minneapolis as part of a residency through the Walker. After sorting through the many designs offered by the public, they approached ecologists and biologists at the University of Minnesota in order to figure out if any of these were feasible. After time consulting, they settled on three interspecies-themed boxes: Monarch butterflies, migrating birds, and lichen, an organism that is helpful in monitoring air quality. More than just artworks, these structures help viewers understand how certain species are being affected by climate change. The project is an opportunity for humans to listen to non-human species and understand what messages they offer us for the future. One of those models was the mailbox that I happened upon in Franconia. 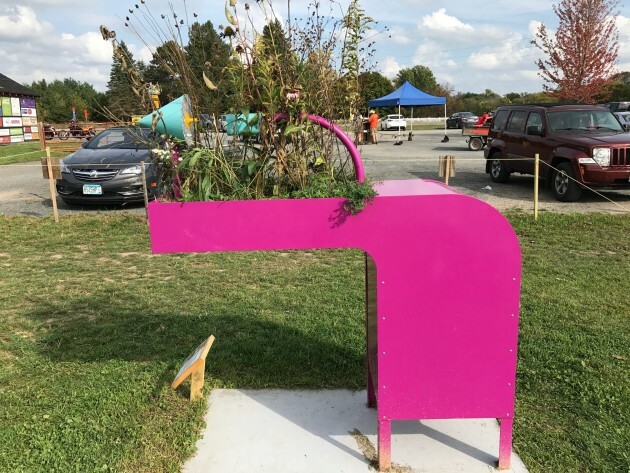 Technically called a pink pollinator box, it’s a hybrid pink mailbox with an attached wildflower bed. Mounted in the wildflower bed is a camera that captures images of Monarch butterflies and other pollinators. This offers a peek into the species and how they’re being affected by climate change, ultimately helping people, scientists and policymakers learn about what is going on. 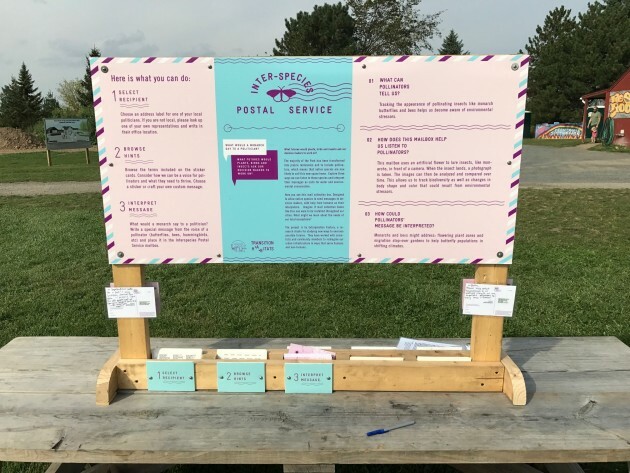 In addition to learning from the species, people are encouraged to write postcards on behalf of the indicator species with ideas for supporting and conserving them. Each station also offers postcards with stickers of various Minnesota representatives. There’s another page of stickers with other words such as “car-free,” “symbiotic,” “insect support,” and “habitat safety” that people can paste onto the postcard along with their message. If you’re not up for making the hike out to Franconia, there are a couple of other pollinator boxes around the Twin Cities, including one at the Minneapolis Sculpture Garden, across from Betty Danger’s at MWMO headquarters (this one is for birds), and another at the St. Paul campus of the UMN’s Ecology building for lichen. There is another lichen mailbox outside of the Walker’s Vineland entrance.